A thermal view of Enceladus' "tiger stripes" taken by the Cassini spacecraft's Composite Infrared Spectrometer during a March 12, 2008 flyby. The higher-resolution images show the ice-spewing plumes are far warmer than previously observed. This story was updated at 3:30 p.m. ET. A sniff test of water vapor spewing from Saturn's moon Enceladus shows it is gushing with organic molecules, increasing the possibility of life existing somewhere in the Saturn system. Scientists have beenintrigued by the moon since thefountain of water was first spotted in 2005. Now they've identified a soup of prebiotic material there, similar to what's found in comets, from an analysis of data collected by the Cassini spacecraft. Nobody really knows howlife began, but astrobiologists guess it required chemicals like those tastedby Cassini, a little liquid water and some unknown spark. Hunter Waite, a Cassini principalinvestigator at the Southwest Research Institute (SWRI) in San Antonio, saidEnceladus' newly understood composition should stir up previous notions ofSaturn and its moons. "These findings willdefinitely get people to ask new questions about the formation of the Saturnsystem," Wait told SPACE.com. "The astrobiological potentialof the Saturn system just went up a notch or two." Cassini madeits observations during a high-speedpass 30 miles (48 km) above Enceladus on March 12, and recorded the highest temperatures yetdetected near tiger stripe-like fissures on the icy moon's southern pole. Waite and other scientistsreleased their early findings about Enceladus' thermal activity and icy plumecomposition during a briefing today at NASA headquarters in Washington, D.C. 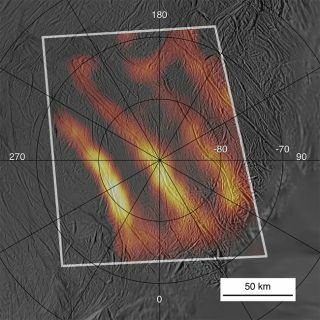 The new heat maps ofEnceladus' surface show temperatures higher than previously observed in thesouth polar region, with hot tracks running the length of giant fissures. "They're still awfullycold, but much warmer than background temperatures of the rest of thesurface," said John Spencer, a Cassini scientist at SWRI in Boulder, Colo. "This means it has to be even warmer under the surface and raises thepossibility of liquid water beneath the [exterior]." Cassini measured the fissuresto be -135 degrees Fahrenheit (-93 degrees Celsius) near their centers. That'sabout 63 degrees F warmer than previously observed and some 200 degrees F (111degrees C) warmer than the rest of the moon's surface. Scientists also say Cassinisampled organic chemicals during its bath in the icy jets and that they aresimilar to those found in comets. "A completelyunexpected surprise is that the chemistry of Enceladus, what's coming out frominside, resembles that of a comet," Waite said, but noted that Enceladusis also very different from a comet. "Comets have tails and orbit the sun,and Enceladus' activity is powered by internal heat while comet activity ispowered by sunlight." In addition to carbondioxide, carbon monoxide and other compounds, Waite said organic molecules suchas methane, propane, acetylene and formaldehyde were sniffed in Enceladus' icyplumes. "Enceladus' brew islike carbonated water with an essence of natural gas," Waite said of themoon's steamy jets. "Astrobiologically speaking, this moon is oneof the most interesting places in the solar system." Dennis Matson, Cassiniproject scientist at NASA's Jet Propulsion Laboratory in Pasadena, Calif., said all of the ingredients for life could be present beneath Enceladus' pockmarkedsurface. "Enceladus has gotwarmth, water and organic chemicals," said Dennis Matson. "Thesethree basic ingredients provide a minimum for the origin of life." But Matson said Cassiniwill have to gather more data before a key element — liquid water —can be verified to exist on the moon. "We ... [can't tell]whether the interior of Enceladus contains liquid water and if that water mightbe a habitat for life," Matson said during today's briefing, "but these are the questionsthat Cassini will focus on in future flybys." The spacecraft is set torevisit Enceladus in August and October of this year, followed by five more flybysin the next two years.